Nowadays all users of crypto currencies want financial privacy and also keeping their personal information hidden from other people. Most of crypto currencies are traceable through their respective blockchain. This means that they are not anonymous, other crypto currencies have some so called anonymity as well. We have noticed that it´s claimed anonymity is not effective or that it has some kind of issues and/or problems in part or no decentralization of operations. LIBREXCOIN source code includes the Libzero library for future native ZEROCOIN protocol support. LIBREXSEND™ was designed to expand LIBREXCOIN with a new feature and give it the ability to perform instant and anonymous transactions without even having to have internet-connection. We designed a new software to meet the above stated requirements. The technology used for the LIBREXSEND™’s engine is unique and innovative. It is the first software solution for offline anonymous transactions. This gives merchants and users flexibility and opens new markets for crypto currencies not previously available and especially for LIBREXCOIN. LIBREXSEND™ is the first bluetooth-based transaction technology for crypto currencies and will be first implemented exclusive on LIBREXCOIN. LIBREXSEND™ will also be extended to work across NFC in the future, allowing users to simply “bump” their phones to share “value” with each other even if no internet access is available. The LIBREXCOIN QT-wallet is linked to the bluetooth-module which is an rpc-application for wallet-communication and bluetooth-handling. 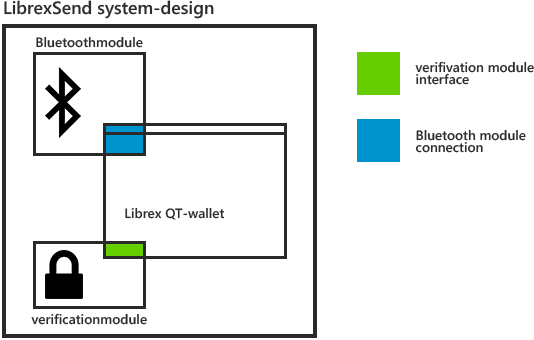 A secure rpc-communication is provided by the integrated verification module. Version 1.0 is .NET based and developed in C++. The l LIBREXCOIN team is currently porting the source to java to provide full platform independence. LIBREXSEND™ Bluetooth communication is handled via WINSOCK (WSA – windows sockets API). The verification module provides the interface for the coin-daemon and Bluetooth engine. 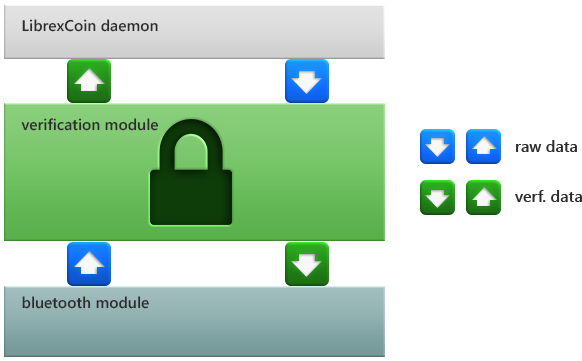 Securing the Bluetooth engine to never communicate directly with the daemon and vice versa. The LIBREXSEND™ verification engine ensures offline transactions are legitimate and secure. This software-package is developed in C++ and its bluetooth engine depends on the winsock 2.2 library (winsock2.h, ws2bth.h). LIBREXSEND™ v2.0 planning phase is nearly ended. This upgrade will extend LIBREXCOIN with a Side Chain. LIBREXSEND side chain will interpolate with the main LIBREXCOIN chain. This will be used for anonymous transactions. The architecture of LIBREXSEND™ v2.0 will burn the anonymously-sent LXC to an internal LXC address. This generates a tx on the side chain. That transaction will generate new encrypted side chain data which will be transferred to the recipient. Once they are confirmed at the recipient's public key the side chain coins will get burned and new LIBREXCOIN generated. No block chain track will be left except the original (to be sent) LIBREXCOIN being transferred to the side chain. Planning stages are under way to integrate side chain advancements. The side chain will be able to facilitate the main chain and as such the whole LibrexCoin network will experience performance and reliability gains. 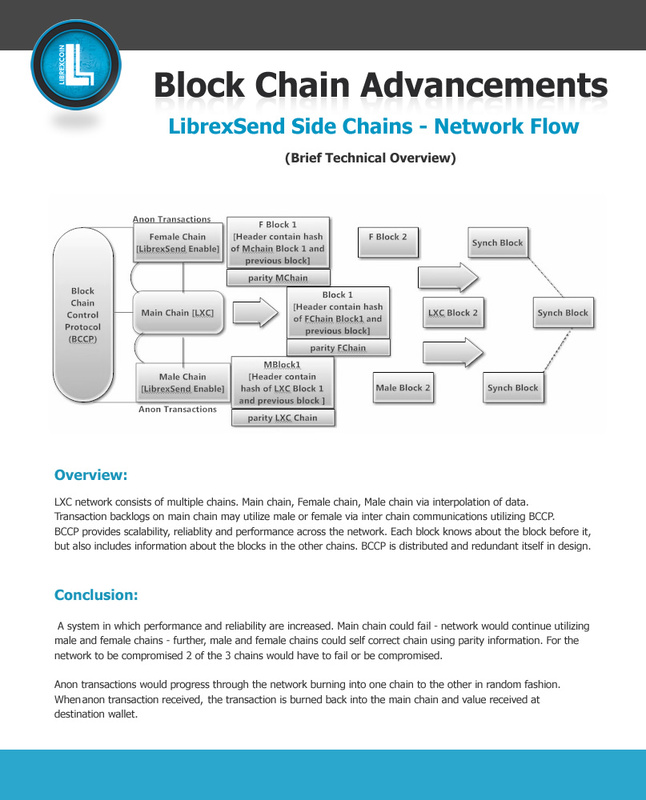 LIBREXSEND™ side chain is the “RAID 5” for Block Chain Technology where by redundant information is shared between the two chains thereby increasing the performance and stability of the whole network.